In a large pot, bring 4 quarts of water to a rolling boil. Remove the woody ends of the asparagus and discard. Cut the remaining spears into quarters and place on a baking sheet. Drizzle olive oil, salt, and pepper over the asparagus and toss so each piece is evenly coated. Bake for 10 minutes. In the boiling water, cook the penne for 10–12 minutes, or until al dente, and drain. Using a blender or food processor, blend basil, pine nuts, garlic, and olive oil until it becomes a paste. Add in Parmesan and salt and blend. 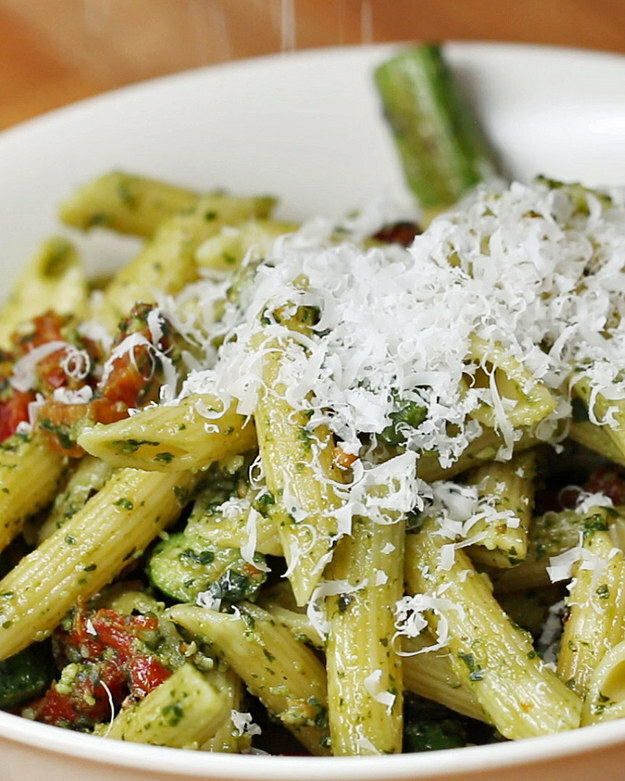 In a large bowl, combine cooked pasta, sun-dried tomatoes, roasted asparagus, and pesto (about 3 hefty tablespoons). Toss together and serve hot or cold, and top with Parmesan cheese. Enjoy! P.S. Leftover ratatouille is delicious on its own or with pasta.